This is a post last year by Grailtrader22 in the Tradestation forums who quotes and copies yet another source, alas without attribution to its source, that seems to fit in this long term investing forum. 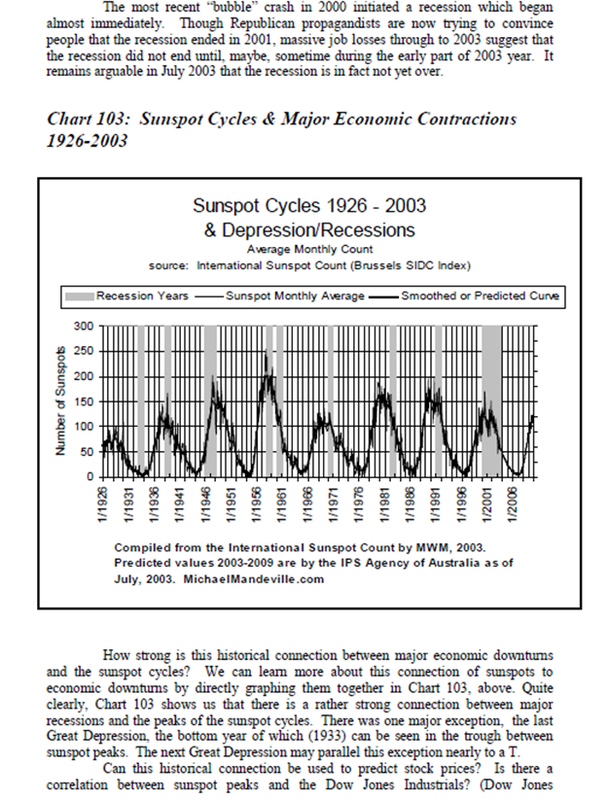 I had never researched the sunspot cycle before as it relates to economic conditions, and had only heard about them in relation to the weather. Hard for precise timing, yet intriguing and evocative. quote:The next Great Depression may parallel this exception nearly to a T.
Opportunity knocks on your door every day-answer it. Interesting to note that it doesn't show us currently in recession, instead tries to say we never ended the 2003 recession. Or am I not looking closely enough? John 21:6 And he said unto them, "Cast the net on the right side of the ship, and ye shall find". They cast therefore, and now they were not able to draw it for the multitude of fishes. My reading was that the source is somewhat dated, that the data stopped in 2003 and the projection stopped about 2010, and that we are passing thru the peaking phase. As an Okie, I know the famous "DUST BOWL" hit in 1935, during the Great Depression. Eerily, it foreshadowed recent weather here. That 1935 February saw a drought and the coldest temperatures in a century. The next year, 1936 saw the hottest temperature on record here of 120. Last year Oklahoma saw the coldest temperature EVER recorded of -31F followed by a 100 degree temperature swing in one week! Following the 1936 pattern, last week saw Oklahoma City tie it's all time high of 113, although the state hasn't seen 120F since 1936. Sunspot activity may have some influence. The next peak has been forecast for May 2013 and it looks to be weak. Note the decline from 2000 to 2010, giving us a Decade of cooler Temperature. World Temperatures Drop again Sunspot numbers cut in half! 1930's Glaciers Melting faster than today! Edited by Rogerdodger, 08 August 2012 - 09:49 PM.